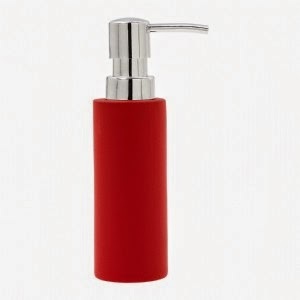 Made with a soft touch finish by Zone Denmark, this Confetti Red Soap Dispenser has a bright body and a shiny chrome top. A sleek little kitchen or bathroom accessory, this soap dispenser fits in perfectly with your other red home accessories. With the soft-touch coating making the Confetti Red Soap Dispenser easy to grip, it also has the benefit of CleanTouch coating too. This means less finger-print all over your lovely soap dispenser.